In the last budget of the current NDA government relief was provided to poor & distressed farmers and tax benefits to the middle class who were significant contributors to Honorable Prime Minister Shri Narendra Modi’s historic victory in 2014. The Interim Union Budget 2019 presented by Honorable Finance Minister Shri Piyush Goyal has ensured additional disposable income for significant section of the society which will boost the consumption and benefit the economy at large in the coming years. Fresh oxygen is also provided to housing & ancillary companies which were under severe stress due to new regulations in the past and will also benefit in generating employment. The working middle class finally got the long pending demand of NIL tax till INR 5L in the budget and the procedural announcements in terms of electronic assessments and refunds in 24 hours were music to years and will motivate more people to file tax returns. Except for few industries the budget has not provided any material relief to India Inc which was expecting some guidance on the reduction of Corporate Tax Rate to 25% though the boost to consumption will benefit all the companies directly or indirectly. The technology industry looks forward to governments initiative in setting up the National Center of Artificial Intelligence however it was disappointed for government not providing any special incentives to companies contributing in R&D of newer technologies like AI, machine learning, data analytics etc. The industry was also looking forward to government providing clarification on few tax anomalies which exist in today’s tax legislations. Mr. Goyal towards the end of his speech also mentioned about India leading the transport revolution through adoption of greener technology vehicles in the coming years, but failed to give any specifics about it or any incentives to boost the production as well as adoption. We may have to wait for the full budget to be presented by the next government in mid of 2019. Pradhan Mantri Kisan Samman Yojana (PMKSY) promises Direct Benefit Transfer of INR 6,000/- per year to poor farmers holding land below 2 hectares & interest benefits in case of natural calamities is good move in right direction, though election results later will tell how much did the farmers get excited by having INR 500 per month in the pocket. It was also commendable to note that electricity for all will be reality by 2019. Finally, the good part is all of this comes without disturbing the fiscal discipline and having the fiscal deficit maintained @ 3.4%. Some of the governments achievements in the areas of implementing direct benefit transfer through JanDhan, Aadhar & Mobile (JAM); building 27 kms of highway daily, 10 lakh people benefiting through Ayushman Bharat and Gas connections to poorer rural families will go long way in building a stronger India. Populism occupied all the front seats in the NDA government last budget before general elections; time will only tell whether this was A Winning Stroke. 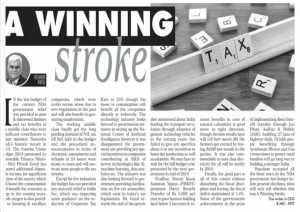 This article was published in the February 2nd edition of Financial Chronicle in India. This was a part of series of Post Budgetary opinions shared by Industry leaders.